Music scholars are recreating ancient Greek songs that haven't been heard for thousands of years. The results aren't very inspiring, but we're finally getting a sense of what the ancients were listening to. Recreating music is a daunting task for historians and musicologists, especially considering that formal music notation wasn't developed until much later. Thankfully, these researchers have some clues to go by. And this is precisely what Oxford musician and classics expert Armand D'Angour has been studying. 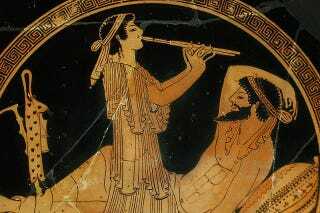 In a recent BBC article written by D'Angour, he points out that the epics of Homer, the love-poems of Sappho, and the tragedies of Sophocles and Euripdes were all originally sung to music performed on the lyre, reed-pipes, and various percussion instruments. But isn't the music lost beyond recovery? The answer is no. The rhythms - perhaps the most important aspect of music - are preserved in the words themselves, in the patterns of long and short syllables. While the documents, found on stone in Greece and papyrus in Egypt, have long been known to classicists - some were published as early as 1581 - in recent decades they have been augmented by new finds. Dating from around 300 BC to 300 AD, these fragments offer us a clearer view than ever before of the music of ancient Greece. This piece was performed by Newcastle University's David Creese. It's a song originally found on stone inscriptions from ancient Greece and performed on an eight-string "canon" — a zither-like instrument with movable bridges. "We must set aside our Western preconceptions," writes D'Angour. "A better parallel is non-Western folk traditions, such as those of India and the Middle East." The ancients would have tuned their instruments differently, for example. That said, some melodies would have been pleasing to modern ears. In the ancient Greek tongue, voices went up in pitch on certain syllables and fell on others; the accents indicated pitch, not stress. Some of the music during this period used subtle intervals such as quarter-tones. And sometimes the melody didn't conform to the word pitches. Interestingly, Euripides was considered an avant-garde composer who frequently violated long-held traditions of Greek folk singing by neglecting word-pitch. There's much more to D'Angour's article at the BBC. Top image: Banqueter and musician, detail. Tondo from an Attic red-figure cup, ca. 490 BC. Found in Vulci.